When I stop at a garage sales, I am always looking for the unique, the different, the unusual. This item caught my eye, and I bent down to look at it closer. Immediately the owner came by and said, “That is a vintage Zales clock set. I don’t know anything about it, but it has a number on the back. I will make you a great deal.” I hadn’t seen anything else, but then I saw the other one. Clock? I saw this one, but no clock. 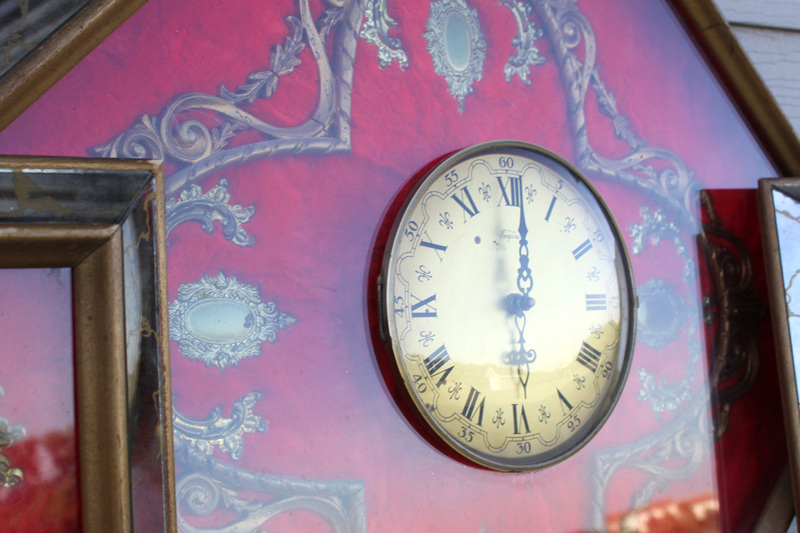 The owner went around the table and pulled out the clock. Ok, this isn’t my style. The ornate look, brass, and the red carpet background. I said I wasn’t interested. However, I must have been the only one who had even looked at it. The owner kept saying she would sell it to me at a great price. She kept lowering the price. Finally when she said $4, I took this home with me. I haven’t been able to find anything out about it. It has Empire Art Products Co from Glendale, NY 953 on the back. I am not sure what I am going to do with it, but it is in my garage. So would you have bought it? Stephanie of Junker Newbie was kind enough to feature my chippy drawer from last week along with Lovely, Etc. ladders. Thank you. I so agree with you. Because as she kept lowering the price, and I really didn’t want it, I kept thinking ,but what if it is an expensive antique piece. So I couldn’t resist at $4. If nothing else I could take it apart and use the clock face and the other piece for a project. I would have thought real hard about buying it, but more to disassemble it and use the parts for something else, I love the look of the crest thingy’s above and below the figures, and the red carpet looking background would make a great fire starter for our outdoor firepit. Like to see what you do with it. Yep, I do think the background would make a great fire starter. Ha. It’s also not my style, but for $4 I probably would have brought it home just to research its background. Hope you find out that it’s worth a lot!!! I guess that is the fun of junking, finding weird or crazy things. I like to think about who originally bought it, why and where did they have it in their home? These are quite cool! They arent my style but for the price I definitely would have thought about purchasing them and researching all about them! Thanks for your comment. I still haven’t found anything out about them. YES! For $4 I would certainly have picked up this unique set! I would probably end up taking them apart and using the pieces for something else. Great find!! It is so fun that a piece can be used as is or taken apart. Maybe, probably, since it was only $4. I love the figures. I see you feel just like I did. I really didn’t want it at first, but the price was too great to pass up. 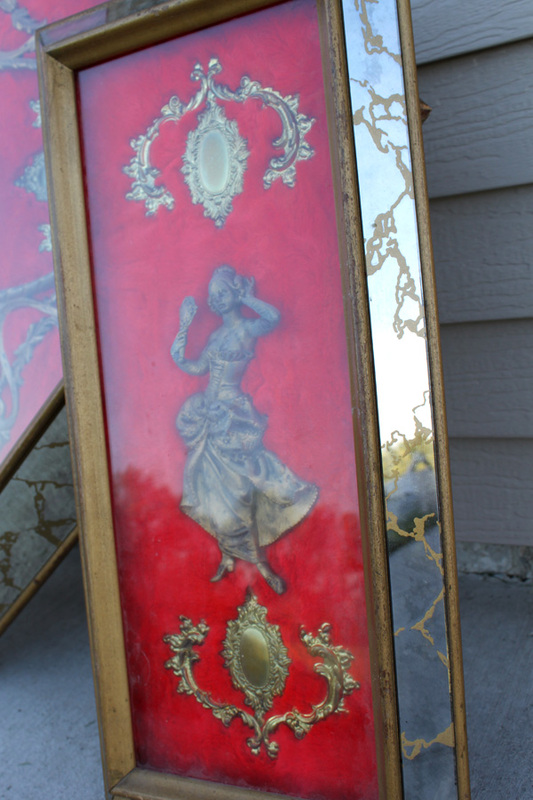 I’m not sure if I would have bought it or not…$4 is really cheap….but it’s not my style…but for $4, you could always experiment with repurposing pieces of it and not feel too bad about it! Experimentation is great when you aren’t going to lose much money. thanks for commenting. We would have bought it for probably a lot higher price… Well done!! i have a set almost like it, mine has a different clock shape, it’s an octagon. i always wondered what went in place of the mirrors on the edge, cause my set is missing the mirrors and since one of the frames had the glass cracked, i took them both off, so now only the clock has glass. the colors of mine are different too, gold tone for the frame and metal pieces in the frame, the carpet is almost the same color, that makes it a little harder to see whats inside the frames besides the roman numeral clock. if you lived close, i’d ask for the pieces you wouldn’t want, especially the red carpet, to add to mine, and give the set i have a different look, i’d just put some around the male and female, to make them stand out. i’d also use the mirror parts. Oh my, love that there is someone else out there that has something like this. I would love to see a photo of your set. It would be so fun to see. It is too bad we don’t live closer. As I decide what to do with mine, I would be willing to share. Do you know anything about these? I still haven’t found anything about them. Thanks so much for commenting. Made my day to know you have one too. my name is tony and I have the very same set anyone know the value? I still have not found anything about it for a value; so if someone does know the value, let us know in the comments. 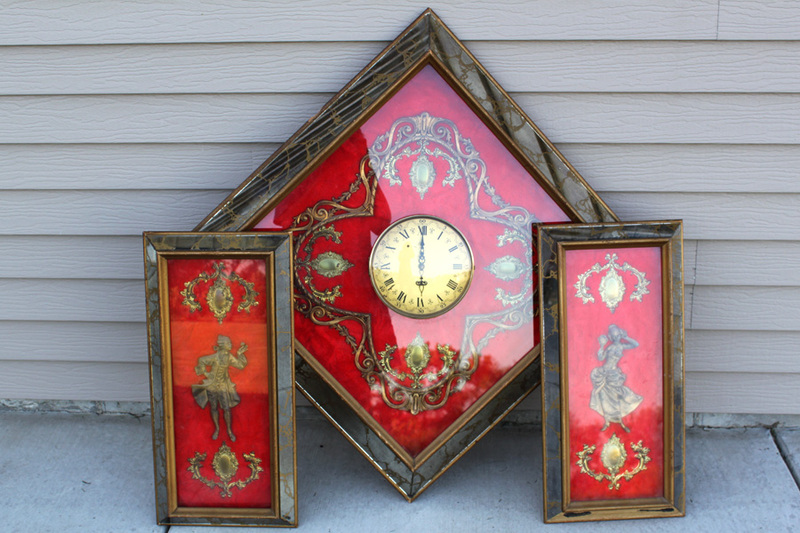 I also have a 3 piece set with a hunter green shaggy feel in the octagon clock and two matching wall hanging pieces. There is gold filigree and two porcelain pieces with victorian people signed Fragnard. I am trying to sell my if you know anyone the is interested. I will send pictures if you like. Its totally different then your but by empire are products. My mother would have bought your in a second she loves the Victorian red. So these are out there. I have no idea how much it is worth. If you ever find out, I would love to hear how much it is worth. Good luck. Hello Karen, I’m Ester again, I’ve messaged previously. Just recently one piece of the figures fell off it was the male on the frame and on the back of him it says “DEPOSE ITALY 56” it has a what it looks like a spider figure next to the 56. I don’t know if it helps but I googled DEPOSE ITALY and I seen many figurines from that company. Thanks, that information does help out. I appreciate your letting me know. What have you done with your set? I still have my set, I had put if to sell but no one had bought it so I decided to keep it little longer because I have a room with antiques and the colors match. Eventually I will sell it. In some months I hope. 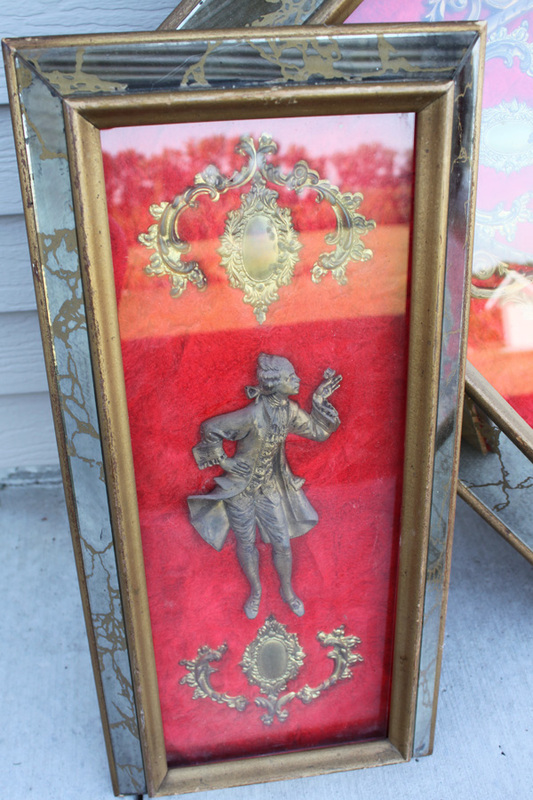 I have one of these, also…except it is in a more oblong shape and the two figures have a frame inside the frame & the number on it is 944….I know nothing about it…it was in my daughter’s things & she has been gone 9 yrs. I knew very little about it as well. I no longer have it. Sorry about your daughter being gone.